In this fourth tutorial in my series on image size, you'll learn how to resize images for email and for sharing online with Photoshop! 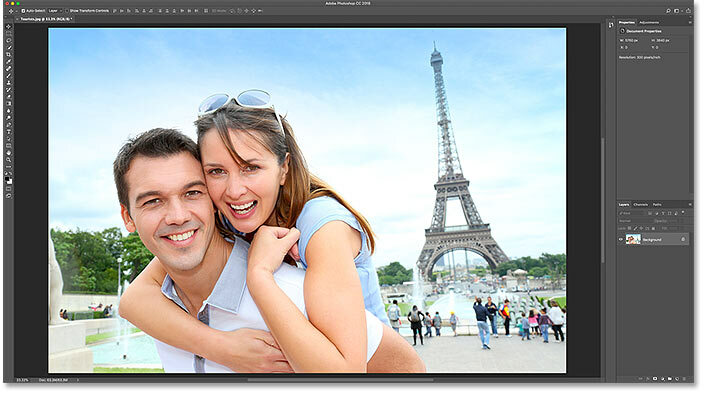 Resizing a photo for the web is different from resizing it for print, which we learned how to do in the previous lesson. With print, there's often no need to change the number of pixels in the image. 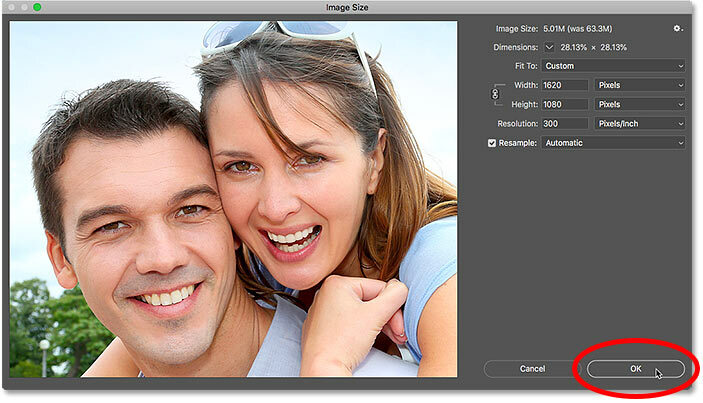 Instead, we control the print size by simply changing the photo's resolution. But when emailing or sharing an image online, we almost always need to downsize the image and make it smaller, for a couple of reasons. First, we need to make sure that the dimensions of the image (the width and height, in pixels) are small enough that it can fit entirely on the viewer's screen without needing to scroll or zoom out. And second, the file size of the image, in megabytes, needs to be small enough that we can send or upload the photo without any problems. 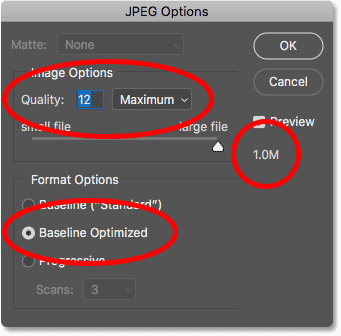 Thankfully, as we'll see in this tutorial, taking care of the first issue (the pixel dimensions of the image) usually takes care of the second (the file size) at the same time. This is lesson 4 in my Image Resizing series. Let's get started! The copy of the image opens in a separate document. 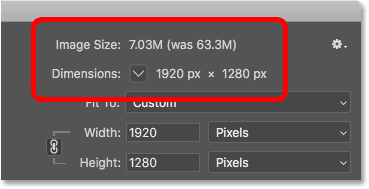 The Image Size dialog box in Photoshop CC. Resizing the Image Size dialog box. You'll find the current image size, both in pixels and in megabytes, at the top of the column on the right. 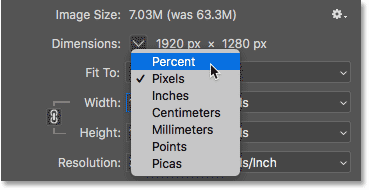 The number beside the words Image Size shows the current size in megabytes (M), and next to the word Dimensions, we see the current size in pixels. The current size of the image. Choosing Pixels as the measurement type. Before we learn how to resize an image for the web, let's make sure we understand the difference between resizing an image and resampling an image. I covered the difference in the previous tutorials in this series, but we'll quickly review it here. Resizing means that we're not changing the number of pixels in the image, or its file size. Resizing only changes the size that the image will print. We control the print size not by changing the number of pixels but by changing the photo's resolution. 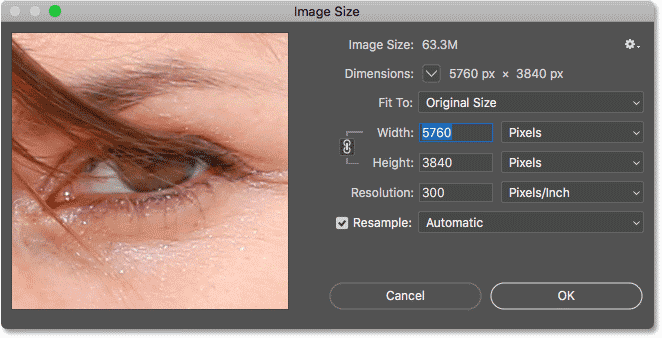 You can learn more about image size and resolution in the first tutorial in this series, and how to resize an image for print in the third lesson. Resampling means that we're changing the number of pixels. Adding more pixels to the image is called upsampling, and throwing pixels away is known as downsampling. You'll rarely, if ever, need to upsample an image for email or the web. But you'll almost always need to downsample it. And as we'll see, by downsampling an image to make its width and height smaller, we make the file size smaller at the same time! Now that we know the difference between resizing and resampling, let's learn how to resample the image so we can optimize it for email and photo sharing. Setting the Width and Height to Pixels. Then, enter the width and height you need. Since the Width and Height fields are linked together, changing one will automatically change the other depending on the aspect ratio of your image. What Width and Height values should I use? Of course, the question is, what's the best width and height to use for emailing the image or for sharing it online? Most photo sharing and social media platforms have their own recommended sizes, and a quick Google search for your favorite platform will give you the size you need. For email, it really depends on the screen size that the person you're emailing the image to is using. While monitors with 4K and 5K resolutions are gaining popularity, the most common screen resolution is still 1920 x 1080, more commonly known as 1080p. Ideally, you'll want the image to fit entirely on the viewer's screen without them needing to scroll or zoom out. So if we stick with the most common screen size (1920 x 1080), you'll want the width of your image to be no more than 1920 pixels and the height no more than 1080 pixels. Changing the Width also changes the Height. 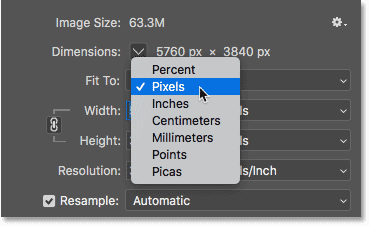 Notice that the new pixel dimensions (1920 px x 1280 px) now appear in the Dimensions section at the top of the dialog box. But more importantly, by reducing the number of pixels in the image, the Image Size section is showing that we've also lowered the file size of the image. We've gone from 63.3 megabytes down to just 7.03 megabytes. Lowering the pixel dimensions also lowered the file size. Changing the Dimensions measurement type to Percent. Viewing the new image dimensions as a percentage of the original size. Earlier, we learned that if we want the image to fit on a standard 1080p display, we need the Width to be no more than 1920 pixels and the Height no more than 1080 pixels. I've lowered the Width to 1920 px, but because of the aspect ratio of my image, the Height was lowered to only 1280 pixels, which means it's still too tall for a 1080p display. Unlinking the Width and Height, and then changing the Height separately. Unlinking the Width and Height is usually a bad idea. Relinking the Width and Height and resetting their values. Resizing the image to fit entirely on a standard 1080p monitor. The image size after downsampling the image. The Interpolation method next to the Resample option. Which interpolation method should I choose? Leaving the interpolation method set to Automatic. What's the best interpolation method for downsampling? Even though Photoshop will choose Bicubic Sharper as the best choice for downsampling images, it's actually not the best choice if you really want the best results. 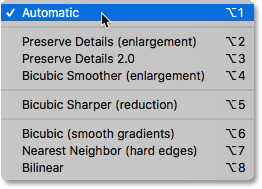 If you just want the sharpest results with the least amount of hassle, then yes, stick with Bicubic Sharper. And by that, I mean leave the interpolation method set to Automatic. Choose Bicubic (smooth gradients) for the cleanest results. What about the image resolution? One option that we have not looked at in this tutorial is Resolution, found directly below the Width and Height options. And the reason we haven't looked at it is because resolution only affects the size that the image will print. Resolution has no effect at all on the pixel dimensions or on the file size of the image. 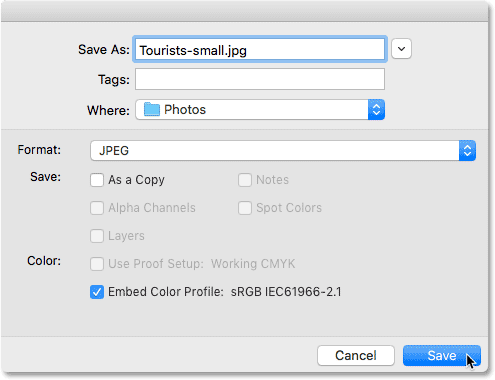 Ignore the Resolution value when resampling images for email or the web. Click OK to resample the image. Choosing the highest quality JPEG options. And there we have it! 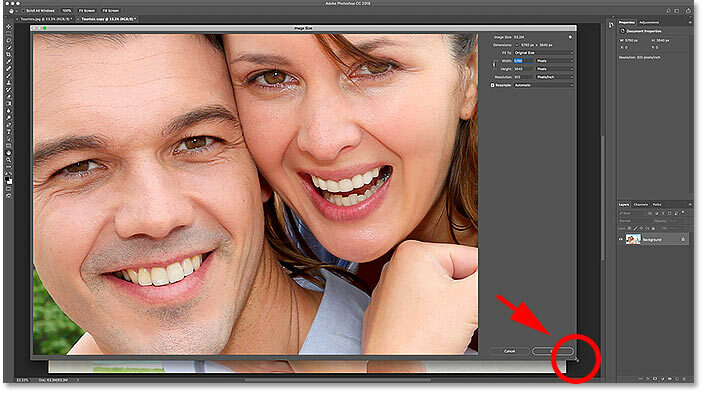 That's how to resize an image for email and for sharing online with Photoshop! 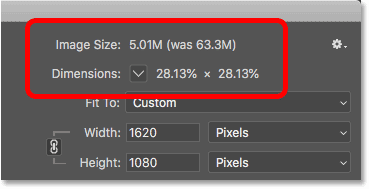 In the next lesson in this series, you'll learn exactly how Photoshop calculates the file size of your image and how easy it is to figure out the file size yourself! And don't forget, all of our tutorials are now available to download as PDFs!